Veteran striker Sharon Jones led the crowd in a chant of "On strike, shut it down!" 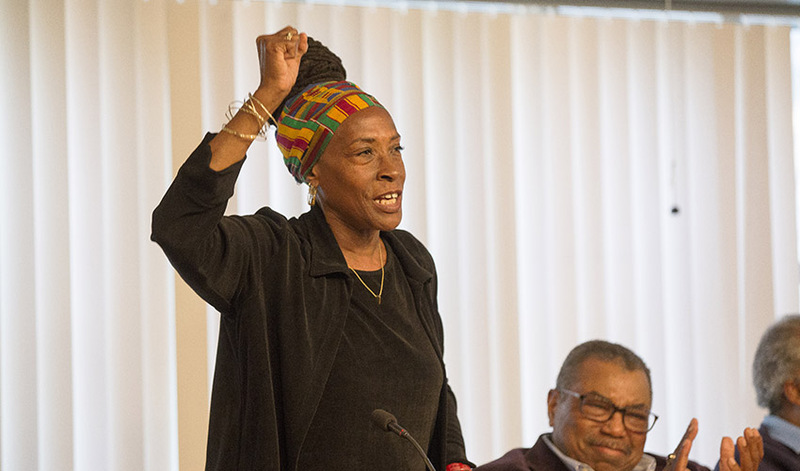 San Francisco State University’s College of Ethnic Studies marked the anniversary of the 1968-69 Black Student Union/Third World Liberation Front (TWLF) strike with three days of events featuring strike veterans, including a keynote address by activist and actor Danny Glover. The event, held at the SF State Towers Conference Center November 8 through 10 and livestreamed on Facebook to 15,000 viewers, included panels of women strikers, discussions about the strike’s influence on ethnic studies, open dialogue sessions with faculty and current students and archival footage of the strike. Panelists told their personal stories and offered advice for today’s student activists. The strike, which began in November 1968 and ended in March 1969, was the longest student strike on an American university campus and led to similar protests at other colleges. The strikers’ demands resulted in the creation of the University’s College of Ethnic Studies — the first and still only such college in the nation. Tascoe offered advice for the next generation of activists. “Find your courage, find your voice, speak truth to power in the moment, and if you can’t, prepare yourself to do it down the road,” she said. Today SF State’s College of Ethnic Studies offers more than 175 courses each semester through five departments: American Indian Studies, Asian American Studies, Africana Studies (originally Black Studies), Latina/o Studies (originally Raza Studies) and Race and Resistance Studies. Amy Sueyoshi, the college’s interim dean, says it must keep growing and changing to remain relevant for increasingly diverse communities. “As we advance student success and empowering education, we will continue to provide transformational learning that impacts both the individual and also larger society,” said Sueyoshi. The College of Ethnic Studiesis planning more anniversary celebrations for March 21–23, 2019.